Turkey's Foreign Ministry condemned the attack near Aleppo's Rashidin district, which killed tens of people including civilians. In a statement released on Monday, the foreign ministry condemned the 'ruthless' attack, noting that it violates the ceasefire in Syria. "The aforementioned attack has shown once again the necessity to strengthen the ceasefire agreement signed on December 30, 2016 and to spread it throughout the country" the statement said. The foreign ministry also highlighted that it is also necessary to implement safe zones for civilians, with the aim to prevent such tragedies, to ensure safety of civilians and the delivery of humanitarian aid to those in need. 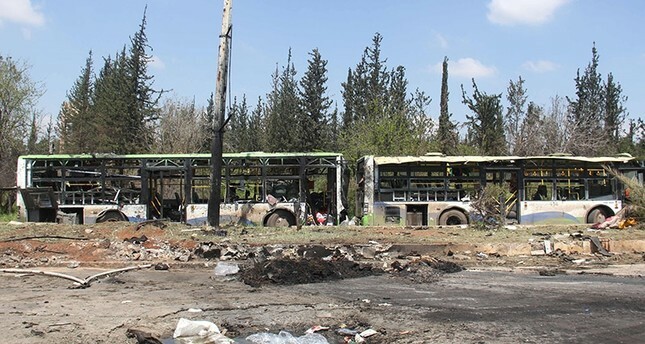 A massive suicide attack on an evacuation convoy carrying civilians from towns besieged by the Assad regime West of Syria's Aleppo killed more than 100 people and wounded hundreds.